The PAC8 is a true one-door controller which provides a modern way of system installation and management via the dedicated PAC8™ App. This smart, compact controller boasts 90% of the features normally only associated with PC-based systems. The PAC8™ can be conveniently configured remotely on any mobile device via the App. Adding tokens has never been easier, simply scan the QR code laser-etched onto a token and create a new user. A single system can be expanded to upto eight PAC8™ controllers and can manage upto 250 unique users, all customisable with individual access privileges. Once the system configuration has been completed by the installer, all programming information is sent from the mobile device to the controller via Bluetooth® connectivity. System settings are also stored in the Cloud allowing for an easy hand over from the installer’s App to the customer’s version. Changing user access privileges, creating new users or deleting redundant tokens is just as straightforward from that point on. System administrators can easily control and enforce secure access on their premises via the intuitive PAC8 App, effectively making complicated access management software a thing of the past. 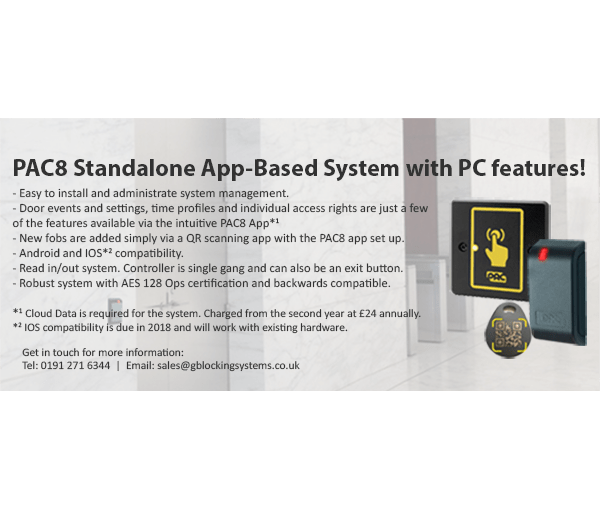 For more information or to buy online please visit https://gblockingsystems.co.uk/locking/shop/buy-access-control-systems/stand-alone-systems/pac-8/.